The Action Tec cogs are machined from 6Al-4V Titanium plate. Each cog is 1.8mm thick and uses the Shimano HyperGlide inner spline pattern so they can be used on any Shimano HG rear hub. The teeth have a swept back design and tapered tops but do not exactly replicate the ramped tooth design of HyperGlide. Large holes are cut through the piece in areas not needed structurally to reduce weight. A set of 3.0mm thick White plastic spacers is included with the cogs. Action Tec also includes one their 11 tooth thread-on lockring cogs described below. There are six models of Action Tec Ti cogs, we sell all six. 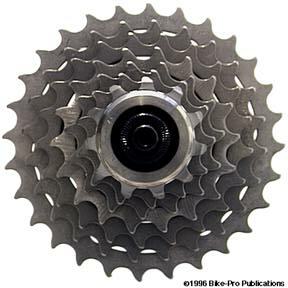 One of Action Tec's more clever parts is this 11 tooth replacement cog. Machined of 6al-4V Titanium the cog has tapered and rounded teeth to work with HyperGlide cogs. The piece replaces the Shimano's 12 tooth steel first position cog and the steel lockring used in the HG70 & HG90, also the XTR and Dura-Ace cassette sets. The Action Tec cog threads into the end of the freehub, an aluminum spacer positions it properly for the chain and changer. The original steel parts weigh 24.5 grams while the Titanium replacements weigh 12 grams.